The Staunton High School name takes effect on July 1, and the school will have a new mascot to match, along with a minor change to the school’s colors. 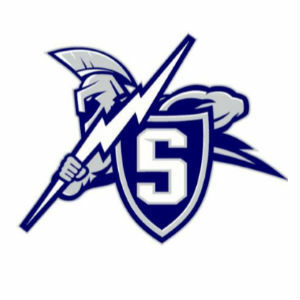 Staunton High School will be the home of the Staunton Storm, featuring a warrior carrying a lightning bolt and shield emblazoned with an “S.” Middle and high school students, as well as high school teachers and staff, selected the moniker and symbol. The selection committee will be working over the coming weeks to finalize new school logos. The school’s colors will be navy blue, white and silver, a small change from the current royal blue, white and silver color combination. A storm combines the elements of lightning, thunder, water, and wind, which is symbolic of the power of many coming together as one force in the new nickname. The storm warrior mascot represents strength, determination, and leadership. A 23-member committee composed of students, teachers and staff worked together over the past three months to develop mascot concepts. All middle and high school students, and high school faculty and staff had an opportunity to weigh-in via a survey in which the committee provided two possible mascots and nicknames – the Staunton Storm and the Staunton Chargers. The designs were developed with the assistance of Jostens, a company well known for providing class rings, graduation announcements, and other school memorabilia, in addition to school branding services. Jostens is providing design services at no cost to the school or school division. Collins said that throughout the selection process, the committee felt it was important to choose a unique and distinctive nickname and mascot for the school. “No other high school in Virginia has the nickname ‘Storm,’ and our designed mascot logo is unique among other schools and professional teams that use the Storm nickname,” Collins said. The alliterative nature of Staunton Storm and the mascot’s natural fit with the school colors were also appealing to the committee. The selection of the mascot, nickname and school colors was made solely by Staunton’s middle and high school students, and teachers and staff at the high school. The Staunton School Board did not participate in the selection process.